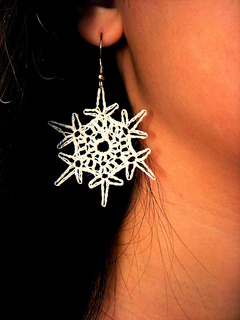 A small simple snowflake to grace your ears, these snowflakes are only 3 rounds to make. They only utilize chain, double crochet, and slip stitches, making it perfect for someone just beginning crocheting (try it with larger yarn first), and a great entry into thread crochet. Each snowflake took less than 15 minutes. Also included in the pattern is a little photo tutorial on how to open the loops of the fish hook earrings if you’ve never worked with wire before. This pattern is fully charted and written out. It is written in US terms. Emylly123, Je55ie, and BikerBitch69 for testing this pattern and providing feedback. 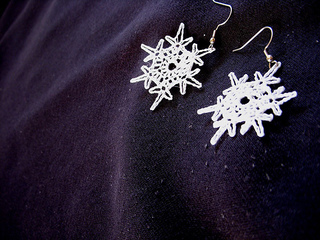 Many thanks also to jrnylst for making amazing snowflakes that inspired me to make these tiny ones.